The ss Catherine was added to the Uniworld Boutique Collection in 2014. The ship is 443 feet long and 37.5 feet wide and carries up to 159 guests and 57 crew members. Staterooms range in size from 162 square feet up to 410 square feet. 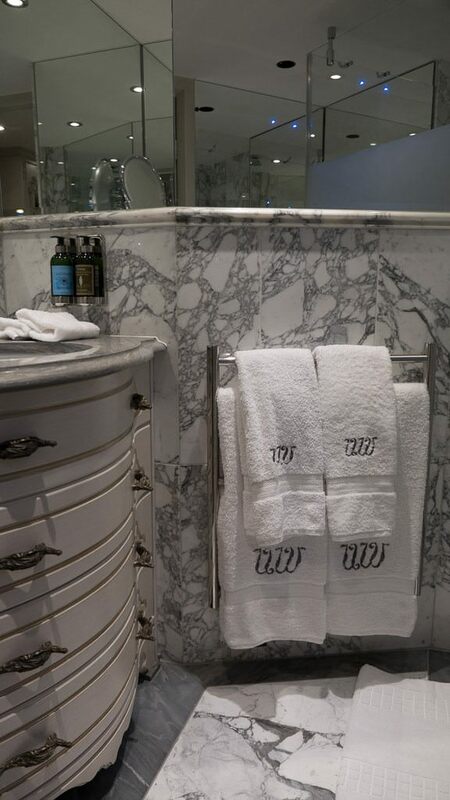 Staying true to Uniworld’s standards for elegance and beauty, the ship features exquisite decor. An extensive art collection, including hand-blown glass pieces, are featured on the the ss Catherine. 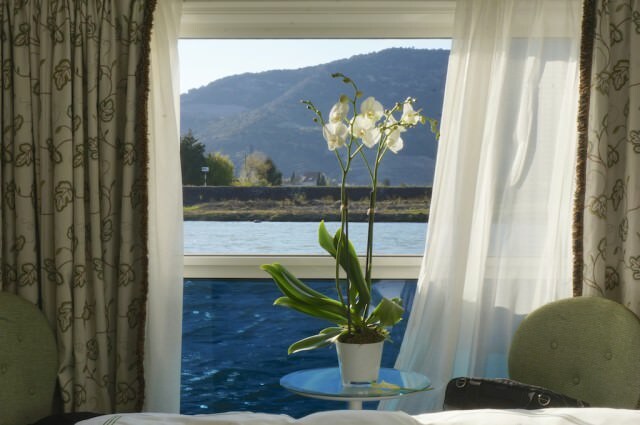 Another nicely-added feature is that all staterooms have a balcony, regardless of the category. While the standard staterooms have an open-air balcony, other stateroom categories offer either a french or full-balcony. 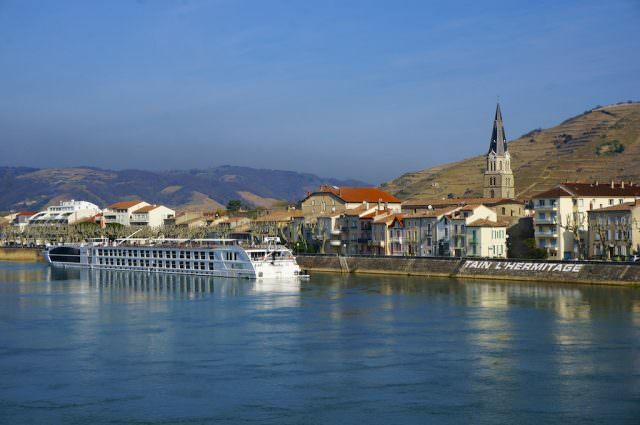 The ss Catherine cruises on the Rhône and Saône rivers in Burgundy and Provence. There are 13 staterooms on this deck and all are located Midship. Category 5 Single – There is only 1 stateroom available located Midship. This category features a fixed riverview window. Stateroom size is 120 square feet. Category 5 is a Standard Stateroom. There are 4 staterooms available located Midship. This category features a fixed riverview window. Stateroom size is 162 square feet. Category 4 is a Standard Stateroom. There are 8 staterooms available located Midship. This category features a fixed riverview window. Stateroom size is 162 square feet. There are 2 stateroom categories on this deck located Midship to Aft. 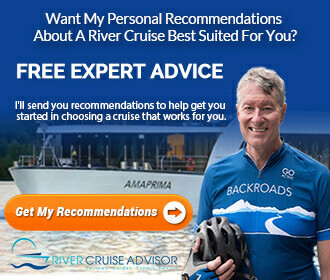 There are 4 stateroom categories on the Camargue Deck. Category 2 is a Deluxe Stateroom. There are 2 cabins available located Midship. This category features a French balcony. Stateroom size is 194 square feet. Category 1 is a Deluxe Stateroom. 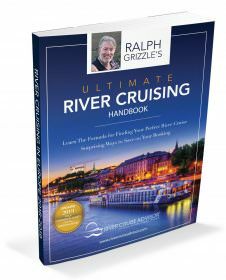 There are 23 cabins available located Midship and Aft. This category features an open-air balcony. Stateroom size is 194 square feet. 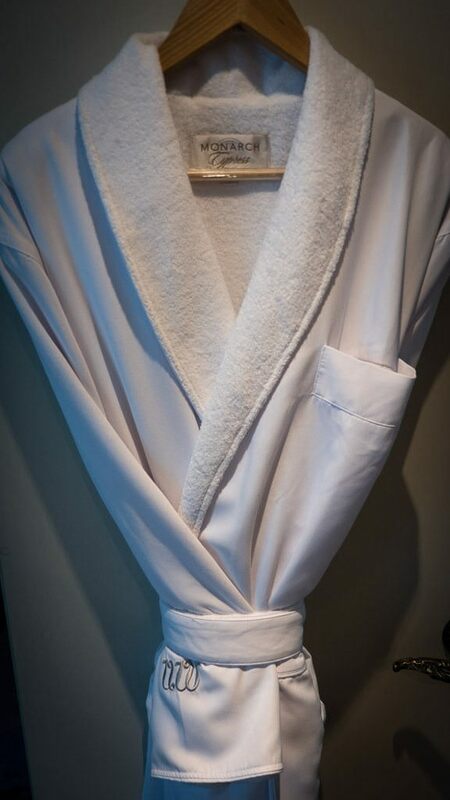 Suite – There are 5 suite staterooms available located Midship to Forward. This category features an open-air balcony. 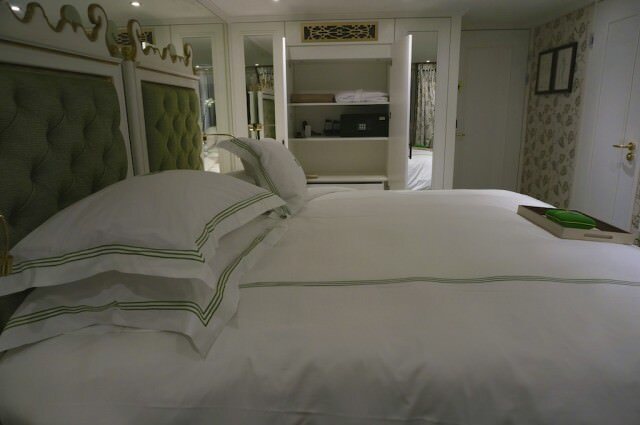 Stateroom size is 305 square feet. 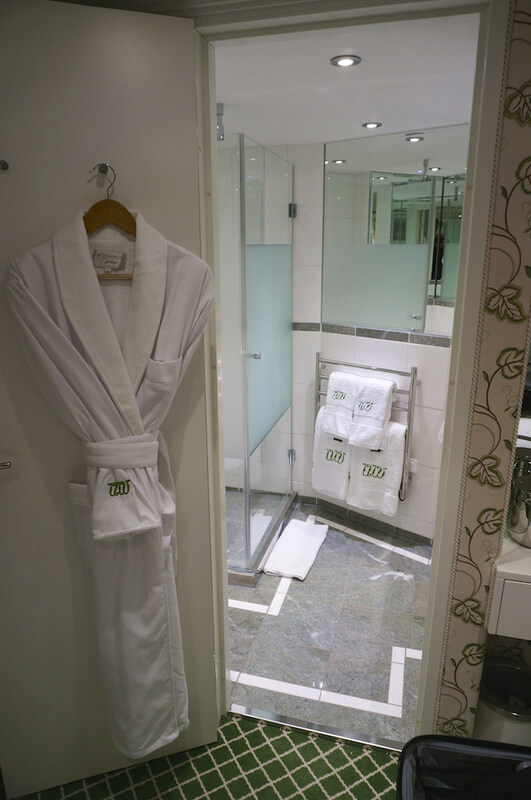 Royal Suite – There is only 1 full suite (#401) available. It is located Midship to Forward. This category features an open-air balcony. Stateroom size is 410 square feet. The ss Catherine offers several public areas; however, there is only one restaurant aboard the ship. And for those who like to socialize in a bar or lounge, there are two located on the ship. On Deck 1 guests will find a Fitness Center, Boutique and a 24-hour coffee station. All are located Forward on the ship. The Serenity River Spa is located toward the back of the ship on Deck 2. 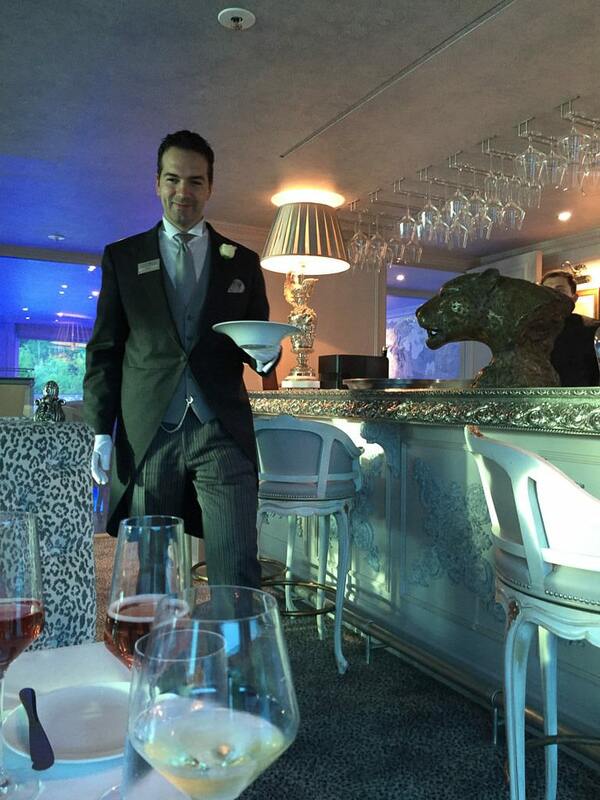 Also, on this deck – the Reception Area and Cézanne Restaurant, which are located toward the front of the ship. On Deck 3 guests can socialize in either the Bar du Leopard (Aft) or the Van Gogh Lounge (Forward). The Matisse Terrace, a heated swimming pool and a 24-hour coffee station can also found on this deck. Learn more about Uniworld’s S.S. Catherine and my four all-too-brief nights aboard at the posts below. Christening ss Catherine. On Thursday, the famed French actress Catherine Deneuve christened the new vessel in Lyon, France, and then she did something that stunned many. Read Christening ss Catherine. ss Catherine resembles a boutique, European hotel. Read other articles about the ss Catherine articles. Your stateroom descriptions are really messed up. Category 5 DOES NOT have a balcony. It has the very smallest of picture windows. What sort of a site is this that can’t even get that right?